Note : The radian is the standard unit of angular measure, used in many areas of mathematics. An angle's measurement in radians is numerically equal to the length of a corresponding arc of a unit circle; one radian is just under 57.3 degrees (when the arc length is equal to the radius). Note : A trapezoid is a quadrilateral with two sides parallel. The trapezoid is equivalent to the British definition of the trapezium. An isosceles trapezoid is a trapezoid in which the base angles are equal so. Note : A parallelogram is a quadrilateral with opposite sides parallel (and therefore opposite angles equal). A quadrilateral with equal sides is called a rhombus, and a parallelogram whose angles are all right angles is called a rectangle. Note: A cylinder is one of the most basic curvilinear geometric shapes, the surface formed by the points at a fixed distance from a given straight line, the axis of the cylinder. Note: A sphere is a perfectly round geometrical object in three-dimensional space that is the surface of a completely round ball. Note: In a planar geometry, an angle is the figure formed by two rays, called the sides of the angle, sharing a common endpoint, called the vertex of the angle. Angles formed by two rays lie in a plane, but this plane does not have to be a Euclidean plane. Note: A circular sector or circle sector, is the portion of a disk enclosed by two radii and an arc, where the smaller area is known as the minor sector and the larger being the major sector. Note: The discriminant is the name given to the expression that appears under the square root (radical) sign in the quadratic formula. Note: In number theory, an abundant number or excessive number is a number for which the sum of its proper divisors is greater than the number itself. The integer 12 is the first abundant number. Its proper divisors are 1, 2, 3, 4 and 6 for a total of 16. Lucky numbers are defined via a sieve as follows. 1, 2, 3,	4, 5, 6,	7, 8, 9, 10, 11, 12, 13, 14, 15, 16, 17, 18, 19, 20, 21, 22, 23, 24, 25, . . . .
Next, remove every 9th number and so on. Finally, the resulting sequence is the lucky numbers. Perhaps the first algorithm used for approximating √S is known as the Babylonian method, named after the Babylonians, or "Hero's method", named after the first-century Greek mathematician Hero of Alexandria who gave the first explicit description of the method. It can be derived from (but predates by 16 centuries) Newton's method. The basic idea is that if x is an overestimate to the square root of a non-negative real number S then S / x will be an underestimate and so the average of these two numbers may reasonably be expected to provide a better approximation. A magic square is an arrangement of distinct numbers (i.e., each number is used once), usually integers, in a square grid, where the numbers in each row, and in each column, and the numbers in the main and secondary diagonals, all add up to the same number, called the "magic constant." 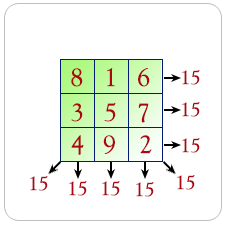 A magic square has the same number of rows as it has columns, and in conventional math notation, "n" stands for the number of rows (and columns) it has. Thus, a magic square always contains n2 numbers, and its size (the number of rows [and columns] it has) is described as being "of order n". In mathematics, the sieve of Eratosthenes, one of a number of prime number sieves, is a simple, ancient algorithm for finding all prime numbers up to any given limit. It does so by iteratively marking as composite (i.e., not prime) the multiples of each prime, starting with the multiples of 2. In combinatorial mathematics, the Catalan numbers form a sequence of natural numbers that occur in various counting problems, often involving recursively-defined objects. They are named after the Belgian mathematician Eugène Charles Catalan (1814 –1894). Note : A linear regression line has an equation of the form Y = a + bX, where X is the explanatory variable and Y is the dependent variable. The slope of the line is b, and a is the intercept (the value of y when x = 0). [[(-5.0, -4.196152422706632), (-5.0, -0.7320508075688767), (-2.0, 1.0), (1.0, -0. -4.196152422706632)], [(1.0, -4.196152422706632), (1.0, -0.7320508075688767), (4. Your score is 100.0%. Thank you. Note: In geometry, a tetrahedron (plural: tetrahedra or tetrahedrons) is a polyhedron composed of four triangular faces, six straight edges, and four vertex corners. The tetrahedron is the simplest of all the ordinary convex polyhedra and the only one that has fewer than 5 faces. Note : In mathematics, the Pythagorean theorem, also known as Pythagoras' theorem, is a fundamental relation in Euclidean geometry among the three sides of a right triangle. It states that the square of the hypotenuse (the side opposite the right angle) is equal to the sum of the squares of the other two sides. Pythagorean theorem calculator! Calculate your triangle sides. Note: In mathematics, the Euclidean distance or Euclidean metric is the "ordinary" (i.e. straight-line) distance between two points in Euclidean space. With this distance, Euclidean space becomes a metric space. The associated norm is called the Euclidean norm. Do not submit any solution of the above exercises at here, if you want to contribute go to the appropriate exercise page.